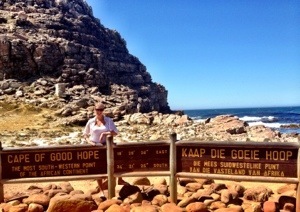 The Cape of Good Hope, at Cape Point, happens to be the most South Westernly point of the continent of Africa. UJust another “I’ve been the farthest ____” moment. The cape, located in Table Mountain National Park, is also one of the most stunning points that the Western Cape province has to offer. 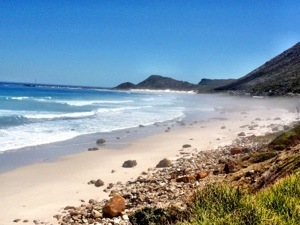 As well, it’s only a little more than an hour from Cape Town, which makes it a convenient excursion for most tourists. 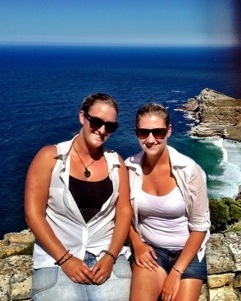 However, despite the plethora of tour buses and the touristy souvenir shops, Cape Point is worth the visit! Kelsi and I managed to make it to the cape just before the crowds showed up. We took the tram to the top of the lookout point, then hiked our way to the lighthouse at the top. The view from there is incredible! Sheer, rocky cliffs, over a dark blue ocean and a never ending view across the sea. The next stop south is Antarctica! The tale goes that from the lighthouse you can sometimes see ghost ships sailing through the water. The rocky waters south of the cape have taken many lives and when the route was first discovered, few ships made it through in one piece. Once again, I can only imagine what the place would look like in a storm. The view from the lighthouse is amazing, but you only get the real picture when you make the half hour hike along the lower path and out to the southernmost point. From there, you can look back on the lighthouse where the throngs of tourists stand to see how extreme the landscape really is. The cliff face that holds up the lighthouse is completely vertical. The jagged rocks at the bottom create a white foam from the rough waters, and the whole thing looks unreal. This was the best part of the entire Cape for me. No one else was around, just the wind and the birds and the view… Oh and Kelsi of course. From Cape Point we drove along to the Cape of Good Hope just around the corner. We snapped some photos and continued on our way. The park had loads of walking trails to check out, but we were pressed for time and had to limit our sightseeing. Next time for sure! 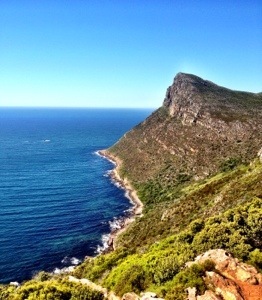 From the Cape, we carried on north towards Cape Town. We passed through some amazing small coastal towns en route and took a million photos. A little ways down the road, we came across a toll highway that was considered a “scenic route”. We figured we might as well lap up the last of the coast while we could and carried on through it. Scenic was an understatement. This place had lookout points every 300 meters and Kelsi and I had to force ourselves to stop at only every second one (otherwise we’d STILL be stuck on that road). The road ran right along the cliff face, overlooking the water. 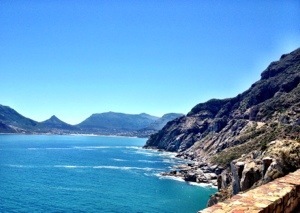 Then it rounded a corner and opened up into Hout’s Bay. 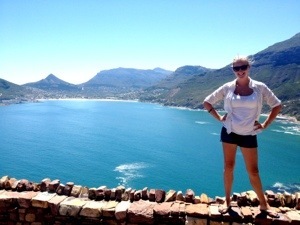 Hout’s Bay is probably my favourite Bay of the trip. It is just large enough to get a beautiful view, but small enough that you can still see the mountains on the other side. The town of Houts Bay is nestled in at the end of the bay, running along the beach and up into the hilly backdrop. This place is paradise! We’d heard so many incredible things about Camps Bay (which we drove through about 15 minutes after Hout’s Bay), but the place was overly populated and very touristy. It was beautiful, but lacked the simplicity of its neighbour town. Just after Camps Bay, we were back in Cape Town. It was early afternoon and we still had a full evening ahead of us! What a crazy last day of sightseeing we’ve had! 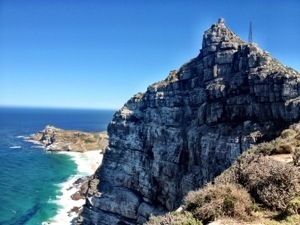 This entry was posted in Africa, South Africa and tagged cape of good hope, Cape point, Cape Town, houts bay, table mountain national park by hilarylust. Bookmark the permalink.